Printable activities can be life savers! When you desperately need a few minutes to fold the laundry, make a grocery list, or even just sit and enjoy a cup of coffee while it’s still hot, low prep activities are the way to go. Keeping your kids busy and engaged while having fun learning is always a plus! 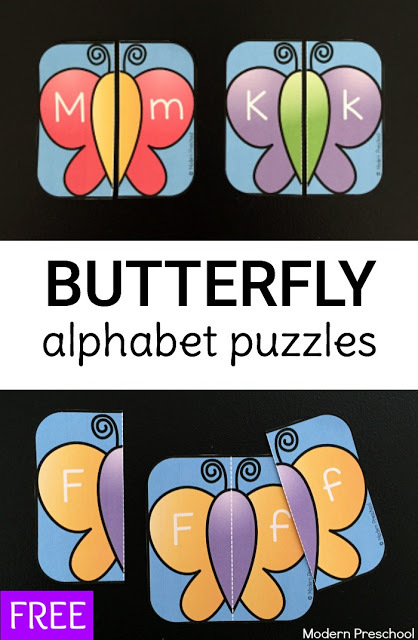 Our butterfly alphabet puzzles are perfect to use as a busy bag at home or a learning center in a classroom setting to practice uppercase and lowercase letter recognition! This alphabet printable set includes 26 butterfly puzzles. Each puzzle has a full butterfly on it with one uppercase letter and the corresponding lowercase letter. Print the butterfly alphabet puzzles below on white printer paper. I prefer cardstock when I am printing activities for my preschoolers. Laminate the set for extra durability. If you chose to laminate the set, you can print, laminate, and then cut the puzzles out! Carefully cut the butterflies in half down the white dotted line. There are 2 main ways to play! For younger learners who are not quite ready to independently match uppercase letters to lowercase letters, PRINT 2 COPIES of the puzzles. Cut out sets like in the photo below. Leave one set as a full puzzle, meaning do NOT cut the puzzles in half down the white dotted line. 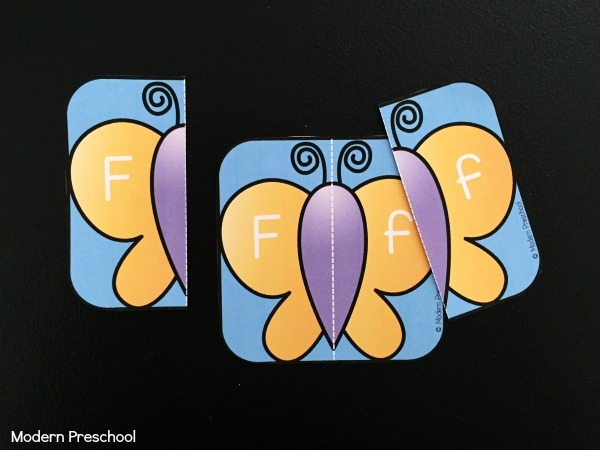 Cut the second set of butterfly alphabet puzzles apart into 2 separate pieces. 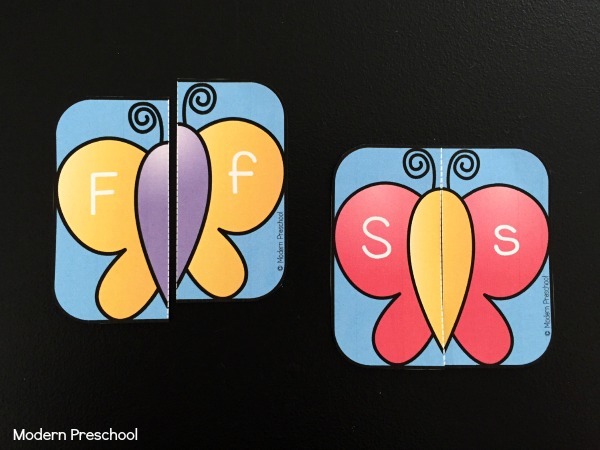 The object is to find the uppercase and lowercase puzzle pieces that match the butterfly that has not been cut apart. The other way to play is to match all of the butterflies back together correctly! Start with a smaller set of butterflies that does not include all 26 letters if it could be frustrating. Mix up the pieces and find the matches! Or flip the pieces upside down and put the puzzles together like a memory game! Grab a set of our butterfly count and clip cards too! Check out these butterfly themed books too! 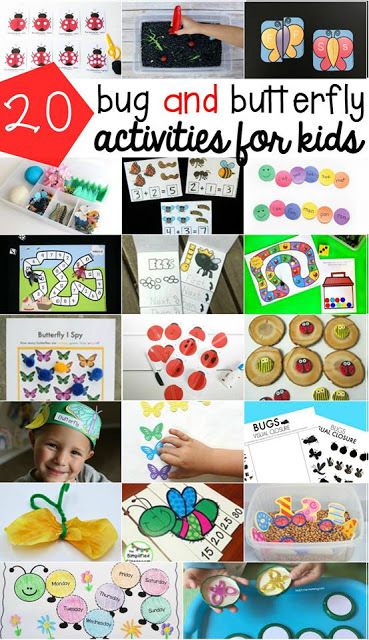 Now that you’ve grabbed your own set of butterfly alphabet puzzles, check out the other bug and butterfly themed kids’ activities from some of my favorite bloggers! I have a self contained class for students special needs and I think they would enjoy the butterfly puzzles. They are so pretty! but it takes SO much ink to print the colored backgrounds. Any suggestions for a more economical way to print them?